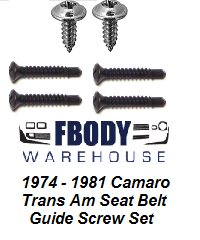 This a set of NEW Seat belt guide mounting screws for 1974 - 1981 Camaro or Trans Am. This a set of seat belt guide mounting screws for 1974 - 1981 Camaro or Trans Am. 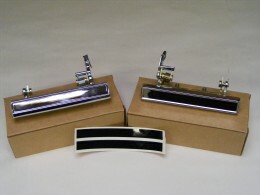 Set includes 4 black mounting base screws, and 2 silver trim screws for the triangle or rectangular seat belt guide.